In Istanbul waren in diesem Jahr drei Veranstaltungen geplant: Am Morgen in Sultanahmet und um 15 Uhr eine für den jungen Armenier Sevag Balıkçı, der 2011 genau am 24. April, dem internationalen Gedenktag zum Völkermord an den Armeniern, beim Militär Opfer eines rassistischen Anschlags wurde. Um 19:15 Uhr hatte der bekannte Menschenrechtsverein DurDe (www. 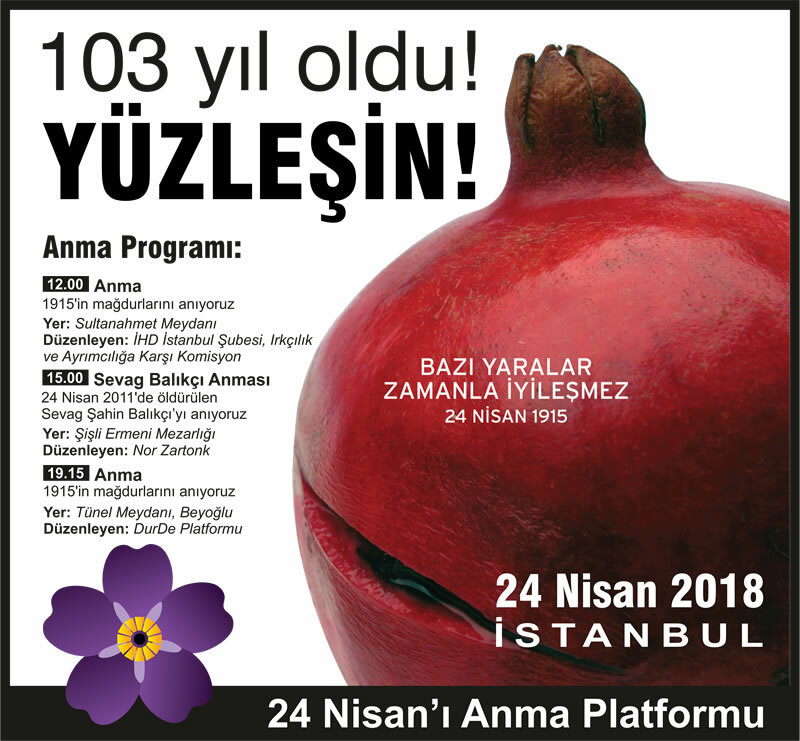 durde.org) seine seit einigen Jahren angemeldete große Veranstaltung am Tünel in Beyoglu, mit internationalen Gästen, wie gehabt geplant, die jedoch zum ersten Mal in diesem Jahr nicht genehmigt wurde. Congratulations for your efforts to keep alive the remembrance of the Armenian Genocide victims. I find it very meaningful. has been rejected by the Governor’s office of Istanbul. There was no explanation about the reason. commemoration planned by the DurDe Platform at 19.15H on the 24th of April for now. delegation from Europe, consisting of anti-racist activists and Diaspora Armenian representatives. They will visit civil society organizations, activists and intellectuals, as well as local Armenian representatives in Istanbul. I’ll be happy to keep in touch with you and exchange information about developments.